Yesterday I was reminded, as I so often am, I’m privileged to count among my friends some of the greatest men on the planet. That’s roughly what I said when I called three of them to share this story. Last month in South Los Angeles, a young Marine named Lance Corporal Carlos Segovia Lopez was shot and killed on his way to pick up a pizza while headed to hang out with a friend. LAPD thinks he witnessed a crime, perhaps tried to intervene. He was out of uniform, on liberty from Camp Pendleton where he was assigned to Recon Training Company. Already an infantryman, he’d volunteered to train longer and harder with the intent of joining the ranks of some of the the Marine Corps’ most elite fighting forces. His death shocked his fellow Marines and left the community he called home in mourning. After immigrating to Los Angeles from El Salvador with his mother as a child, he grew to become a leader in his neighborhood. He was known around his community for his volunteering and service work. He led a youth group called Teen Project, which aimed to motivate high school students to finish school and “go the right way in life.” He also worked at LA on Cloud 9, a nonprofit that provides services to homeless people and helpless pets. He insisted on feeding all of the pets he encountered when he took food to people living in encampments around Los Angeles. He was one of the good guys in the truest sense of the words. One of my best friends is the Marine serving as the commander of Advanced Infantry Training Battalion-West. He had the honor of delivering a eulogy at Lance Corporal Segovia’s funeral and later presenting the burial flag to his mother. Here’s the NBC LA coverage of the funeral. The thing you won’t see in any of the news coverage is this: the tall, white, Irish Catholic Marine lieutenant colonel who presented Sandra Lopez with the flag that was draped across her son’s casket just moments before, presented it to her in Spanish. Undecided about whether to use English or Spanish, LtCol Rory Quinn memorized the already familiar words in a language not his own, but native to Ms. Lopez. 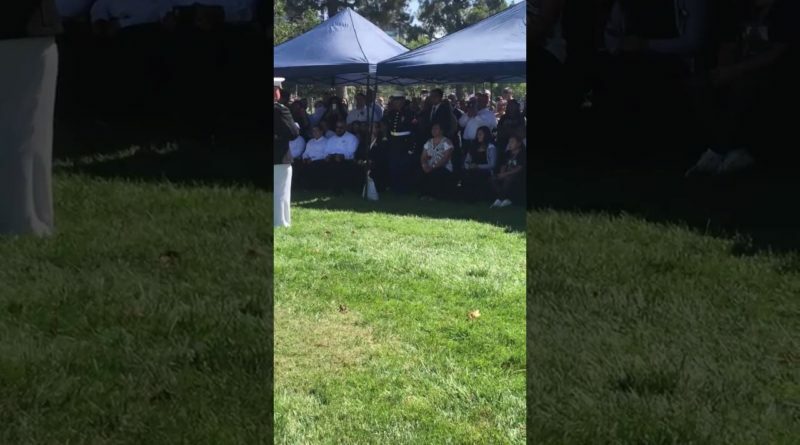 Sandra Lopez delivered much of her son’s eulogy in her native Spanish, explaining she didn’t have all of the English words to share the array of emotions. Switching to English, perhaps for the benefit of the Marines in the crowded church, she recounted the day he asked her to sign his enlistment papers. He was still 17 at the time. Sitting in the pew listening, Quinn made the decision to convey the graveside condolences of the President of the United States, the Marine Corps and the Nation, in the language he thought would have the most impact. De parte del Presidente de los Estados Unidos de America, el ejercito de la marina y una nación agradecida, por favor acepte este bandera como símbolo de nuestro agrandamiento por servicio honorable y fiel de su hijo Carlos. On behalf of the President of the United States, the United States Marine Corps, and a grateful nation, please accept this flag as a symbol of our appreciation for your son’s service to Country and Corps. “(He was) a man we shouldn’t have to lionize in his passing, because in his living he was what we aspire to be. Not just in our service, but in our hearts,” Los Angeles Mayor Eric Garcetti said at the funeral. Still a teenager at 19, already a community leader, there are no leads in his murder. He was buried at Los Angeles National Cemetery in West L.A.
I’m sad another American mother buried her son, sad the community lost such a dedicated young man, sad the Corps lost a promising young Marine, and sad we lost a great young American. I’m glad the Marine presiding over the ceremony was as thoughtful and considerate as Rory Quinn. EDIT: They’ve arrested three gang members in connection w/ LCpl Segovia’s murder.